Carleton baseball began in 1882, and in the 120 years prior to Rushing’s arrival on campus, the team totaled 10-plus triumphs only 14 times, a feat accomplished in 11 of the last 12 campaigns under Rushing’s direction. He has guided the Knights to five of the top seven win totals in program history. Formerly an assistant baseball and football coach at his alma mater, Grinnell College (Iowa), Rushing brings a wide variety of experiences to Carleton’s baseball program. In his only year as head coach at Minot State University, he inherited a team that had only six wins the previous season. Under Rushing’s direction, that squad won the conference tournament and qualified for the regional tournament for the first time since the Minot State program was resurrected in 1988. He also served as pitching and catching coach for two summers with the Lehigh Valley (Pa.) Catz, a summer collegiate team in the Atlantic Collegiate Baseball League. Rushing’s pitching staff set a Catz record with a 2.23 ERA, helping them to the 2003 ACBL regular season and tournament championships. Ten pitchers and two catchers from those teams went on to play professionally. A 2001 graduate of Grinnell with a degree in economics, Rushing was a pitcher and catcher for the Pioneers and captained the two winningest teams in school history. Following his collegiate career, Rushing played baseball for a season in France, pitching and playing infield for the Toulouse Tigers. He earned his master’s degree in management from Minot State in 2004. During Rushing’s tenure, the Knights boast 18 All-MIAC awards, 11 All-Region awards, 6 academic all-district awards, 45 academic All-MIAC awards, a Fulbright Scholar, and an Arthur Ashe Jr. Sports Scholar. Rushing, an associate professor in the physical education, athletics, and recreation department at Carleton, and his wife, Naomi, live in Northfield with their daughter, Bella, and son, Tori. 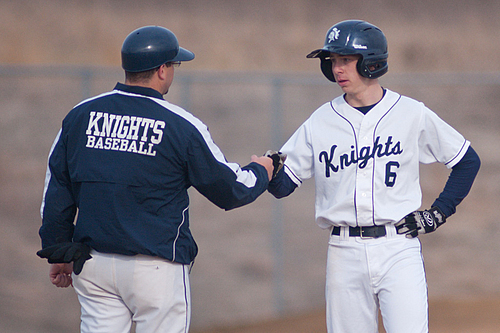 Jim Christensen has been a member of the Knights baseball coaching staff since 1998. A longtime Carleton assistant football coach, he graduated from St. Olaf College, where he played both football and baseball. Christensen is a local insurance representative as well as an experienced high school and college basketball official. He was a pitcher and outfielder for the Northfield Millers, a local amateur age 35-and-over ball club that captured the 1997 and 1998 state championships. Mick Williams joined the Knights coaching staff in 2016. He graduated from Northern Montana College in 1977 after spending four years in the military. Played baseball at Northern until program was dropped. Has over 30 years experience coaching both baseball and football. 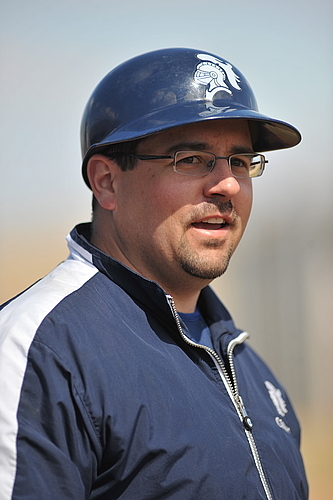 Has coached football at both the high school and collegiate level, baseball at the high school level. While coaching the Havre American Legion team, Williams has won (2) State Championships, (2) runner-ups, (3) third place finishes, (7) district championships and posted over 900 wins. He and his wife split time living in Havre, Montana and Northfield, where his two daughters, sons-in-law, and five grandsons live.